In 2012, national expenditure for dental services reached a staggering $111 billion. Yet many children and adults still go without measures that have been proven effective in preventing oral and dental diseases, and reduce dental care costs. For example, over 100 million Americans still do not have access to water that contains enough fluoride to protect their teeth. Over a century ago, in 1901 Dr. Frederick McKay arrived in Colorado Springs to start his dental practice, and began to investigate why so many of his patients had a mysterious brown staining of their teeth. McKay spent thirty years investigating and in the process found that the strangely stained or “mottled” teeth were also decay free. He went on to establish drinking water as the cause. Around this time, in 1931, H.V. Churchill, a chemist working for the Alcoa Company, concerned about a possible link between bauxite, an aluminum ore, and tooth staining, analyzed water from several associated areas and found that fluoride was the common factor. Dr. H. Trendley Dean studied fluoride in 1931. Dean went on to suggest that a fluoride concentration in the water supply of about one milligram per liter (1 mg/L) or 1 part per million (1ppm) — roughly equivalent to a grain of salt in a gallon of water — is associated with substantially fewer cavities. On January 29, 1945 community trials were conducted to test the hypothesis that adding fluoride to water supplies would prevent tooth decay. This was the start of the now famous Grand Rapids, Michigan studies, which when published in 1950 showed significant reduction in decay. By 1951 “fluoridation” became the official policy of the U.S. Public Health Service, and by 1960 water fluoridation became widely used in the U.S., now reaching 70% of all Americans. In 1955 the first clinically proven fluoride toothpaste was launched. Today, sodium mono-fluoro-phosphate and sodium fluoride at a concentration of 1000 to 1100 ppm, are the most popular active fluoride ingredients in toothpaste. However, water fluoridation remains the most equitable and cost-effective method of delivering fluoride to communities. 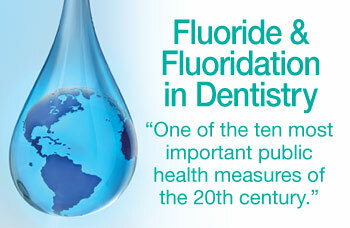 Dean and his colleagues assumed that fluoride’s protection against cavities was because of its incorporation into developing teeth, before they erupt into the mouth — a so-called systemic (through the body) effect. Today, we know that the predominant effect of fluoride is topical or “local,” at the tooth surfaces. Fluoride must be present in the right place, namely in saliva and the biofilm (dental bacterial plaque), at the right time in order to interfere with the caries (tooth decay) process. This process is a swing and balance affair between acid dissolution (softening or de-mineralization) and re-hardening (re-mineralization) of the tooth surfaces. Enamel demineralization occurs when the pH of the tooth’s biofilm decreases to below 5.5 — the result is mineral dissolution. However, in the presence of fluoride there is more re-mineralization and as a consequence, net demineralization is reduced. After exposure to sugars has ceased, acids in the biofilm are neutralized by saliva and converted to salts. As a result, the pH increases, and at pH 5.5 or above, the biofilm fluid is “supersaturated” with fluoride. Calcium lost by enamel can be more efficiently recovered if fluoride is present in the biofilm.